Esther 4:12-17 When they told Mordecai what Esther had said, 13 Mordecai told them to reply to Esther, “Do not think that in the king’s palace you will escape any more than all the other Jews. 14 For if you keep silence at such a time as this, relief and deliverance will rise for the Jews from another quarter, but you and your father’s family will perish. Who knows? Perhaps you have come to royal dignity for just such a time as this.” 15 Then Esther said in reply to Mordecai, 16 “Go, gather all the Jews to be found in Susa, and hold a fast on my behalf, and neither eat nor drink for three days, night or day. I and my maids will also fast as you do. After that I will go to the king, though it is against the law; and if I perish, I perish.” 17 Mordecai then went away and did everything as Esther had ordered him. Romans 14:7-10 We do not live to ourselves, and we do not die to ourselves. 8 If we live, we live to the Lord, and if we die, we die to the Lord; so then, whether we live or whether we die, we are the Lord’s. 9 For to this end Christ died and lived again, so that he might be Lord of both the dead and the living. John 14:25-27 [Jesus said to his disciples] “I have said these things to you while I am still with you. 26 But the Advocate, the Holy Spirit, whom the Father will send in my name, will teach you everything, and remind you of all that I have said to you. 27 Peace I leave with you; my peace I give to you. I do not give to you as the world gives. Do not let your hearts be troubled, and do not let them be afraid. I went to a play called “Sweet and Lucky” about a month ago. Not your usual play in which you walk into a theater, sit down, and watch the actors on a stage. “Sweet and Lucky” guides the audience in small groups, out of sequence from each other, across many rooms and sets as it tackles the idea of memory and how it works. A relevant aside, I just found out last week that the show’s New York director, Zach Morris, is a confirmed son of the Augustana congregation. I mean that in the ritual sense. Years ago, he affirmed his baptism in the rite of Confirmation here. His mother Maggie and sister Katelynn continue to worship here regularly. Maggie handed me an article last Sunday about the play. Funny how things happen like that and a connection can be seen only in hindsight. And that takes us back to the play and why it may be at least loosely relevant to the sermon today. At one point, an actor asked me if I believe in luck. I said, “No.” She then asked if I believe in fate. I said, “No…I think there’s an option that we aren’t able to understand.” Just her luck that she got to talk with me, eh? But her questions are onto something. We are meaning-making beings. Things need to mean something. If they don’t mean something, we’re stymied. If they mean something terrifying, we’re still stymied. We throw everything we can at situations to find some kind of answer to feel better about them. Whether it’s luck, fate, karma, God’s will, free will, or something else I can’t think of at the moment. Things happen and we start asking “why?” We want answers. We are answer mongers and meaning makers. When things happen, either we find answers or we make them up. This reasoning out the “why” is the surface appeal of the Book of Esther. Esther is an orphan 500 years before Jesus. Not just any orphan, she’s descended a few generations from the Jewish people who were rounded up in Jerusalem and carted off into Persia by the king of Babylon. Esther is adopted by her cousin Mordecai and raised as his own daughter. Esther’s story is cleaned up quite a bit for the G-rated worship musical the kids are preaching through this morning’s 10:30 worship. To get the full story takes reading this Bible book laced with dark humor and questionable outcomes. While reading, it’s engaging to wonder about your own life as reflected in Esther’s self-sacrificial courage, Mordecai’s righteous determination, Haman’s fearful self-preservation, and King Ahasuerus’ detached ignorance. Esther’s story is meaningful and relevant to the current moment in the world. She begins in the royal court, a place of comfort tainted by episodic fear and indifference. Rattled by Mordecai’s truth, her acceptance of risking death has a self-sacrificial purpose – neither fatalistic nor nihilistic. She listens to him, formulates a dubious plan, and goes into action on behalf of her people. And the parts of the story you just heard happen in only four short chapters with a little over half the book to go. They’re good partly because the stories they tell are about complicated people. Trusty Noah? Read what happens after the flood when he builds a vineyard and makes wine. Faithful Abraham? Lied about Sarah being his sister to save his own skin not once but twice! Biblical heroes are often as flawed as they are faithful. That makes for good story. It also makes for something more than a good story. It means that we have a shot at seeing our particular iteration of flawed and faithful in the pages of the Good Book. Esther is no exception to Dr. George’s “GOOD story” category. 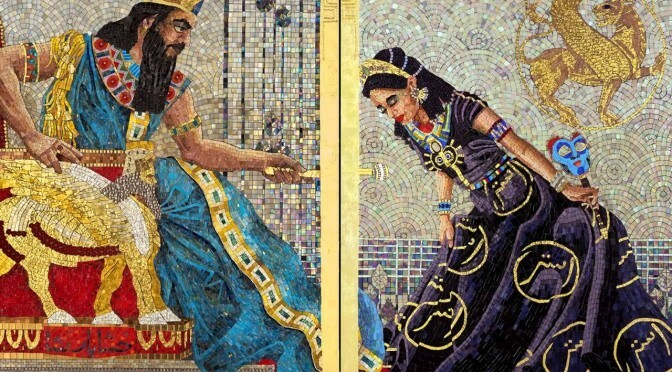 In the face of Haman’s treachery and King Ahasuerus’ indifference, Esther is challenged to save her Jewish people, putting her life at risk to do so. But the reality is that while we aspire to Esther, we’re regularly caught in moves that smack of King Ahasuerus’ ignorance or Haman’s power grab. Comparing Esther’s self-sacrificial resolve to Christ’s self-sacrifice may get us a little further. Today’s reading from the Gospel of John is good for this comparison. In John’s Gospel, Jesus’ death on the cross is the inevitable outcome to his life-giving ministry. Inevitable because the life he offers is one of mercy, freedom, and peace which is perceived as a threat by the people around him. In his death no hand is raised against the people God so loves. Rather, Jesus is resolved to see it through. Resolve that ends in self-sacrifice on a cross. Paul’s words are a confession of faith. Not a faith that protects us against the struggles of life and death. Rather, a faith that confesses Jesus’ resolve to make redemption and healing known even from the most difficult situation. And still we may not see the redemption and healing except for time passing and hindsight, if we get to see it at all. The readings today from Esther, Romans, and John, offer slightly different perspectives on fear, death, and peace. In John, Jesus promises peace as the One whose ultimate self-sacrifice on the cross is purposeful rather than nihilistic – gathering us around the tree of the cross, transforming death into life as well as our self-preservation and indifference into action for the sake of the world God so loves. Zach Morris. Sweet and Lucky, a collaboration between Third Rail Projects and Denver Center for Performing Arts Off-Center. Esther, chapter 3. Direct quote is from verse 13. See Genesis chapters 12 and 20. John 10:1-10 Very truly, I tell you, anyone who does not enter the sheepfold by the gate but climbs in by another way is a thief and a bandit. 2The one who enters by the gate is the shepherd of the sheep.3The gatekeeper opens the gate for him, and the sheep hear his voice. He calls his own sheep by name and leads them out. 4When he has brought out all his own, he goes ahead of them, and the sheep follow him because they know his voice. 5They will not follow a stranger, but they will run from him because they do not know the voice of strangers.” 6Jesus used this figure of speech with them, but they did not understand what he was saying to them. 7So again Jesus said to them, “Very truly, I tell you, I am the gate for the sheep. 8All who came before me are thieves and bandits; but the sheep did not listen to them. 9I am the gate. Whoever enters by me will be saved, and will come in and go out and find pasture. 10The thief comes only to steal and kill and destroy. I came that they may have life, and have it abundantly. 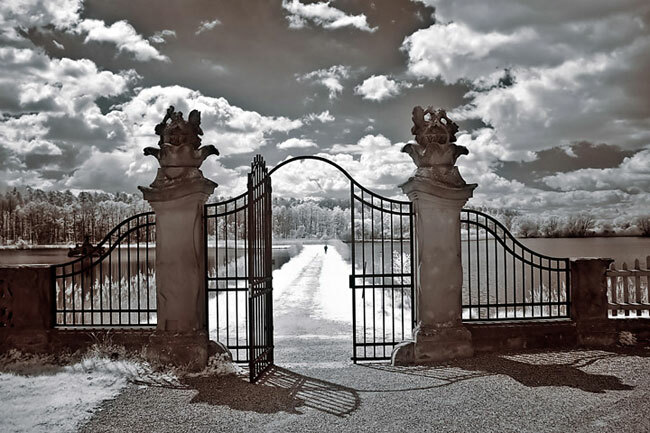 Think for a moment about gates that you come across in your day-to-day. Picture the gate in your mind and who controls the gate and whether the gate stands opened or closed. Think about what the gate is for, who is allowed to go in and go out of that gate and what it costs to move in and out of the gate. Now, picture another gate. It’s made of iron, as sturdy as a gate can be made. This gate is open, wide open. It’s so open that it’s welded open. There is freedom of movement as it stands open. The gate cannot be closed or manipulated in any way. It simply…stands…open… this is the gate I would like you to have in mind for the next few minutes. A gate that stands open. A few weeks ago, Pastor Pederson preached to us about the story that comes right before our verses today about Jesus is the gate. About the story of the man born blind to whom Jesus gives sight. The man born blind, who can now see because of Jesus, is asked all kinds of questions by the religious leaders of the temple and they ultimately drive him out of the temple when their questions aren’t answered to their expectations. And Jesus receives that man who had once been blind. The experience of the man born blind being given his sight by Jesus which launches the man into a maelstrom of questions asked by the community is the entry point to Jesus naming himself as the gate. How many times has a new experience led us to new questions? And those new questions to new answers? Answers that challenge how we think about life and how we think about God. Time and time again as children our minds stretch and grow to absorb all the new stuff we see and do and hear. Time and time again as teenagers and, hopefully, if we’re lucky, time and time again as adults. We are challenged to either understand something new or take on something new in the face of new information that arrives on the scene. It is the way of life. And for Jesus followers, it is a way of faith as we try to figure out what in the name of God…literally, in the name of God…we’re talking about when we talk about Jesus. But it is also the way of life to not let in all the possibilities and information. It is also the way of life to be overwhelmed by it. It is also the way of life to be knocked down by the sheer quantity of information and experience that blow our minds and leave our expectations in tatters. And it is the way of life to close ourselves off and create our own sheepfolds – sheepfolds that set-up our own beliefs about Jesus as the gate. We set up a gate so that we might feel some small glimmer of hope that our right faith keeps us safe from that which would harm us or destroy us. And, very quickly, we fall to the same temptation as the religious leaders did with the man born blind and we drive people out as if we ourselves are the gate. And then I like to take a big breath as Jesus says to his disciples, “I am the gate.” Because Jesus as the open gate in this passage is very, very different than thinking about Jesus as the faith-ticket-taker. You know, like I have my ticket of faith which gives me entrance to the right church and then, at the just the right time, I hand my ticket of faith over to Jesus so that all will be well, so that I will be well. I’m pretty sure there are no tickets of faith-in-Jesus that purchase protective outerwear for deflecting the worst kind of pain. Perhaps to confirm this we could check in with a few of our most faithful brothers and sisters in the nearest ICU or hospice. And I’m pretty sure that there is no ticket-of-faith in Jesus that unleashes a cash windfall – perhaps we could check in with some of our poorest and most faithful brothers and sisters, numbering in the millions across the planet, who wonder where their next meal is coming from. In fact, what these faithful brothers and sisters all over the world experience is what we experience. We all experience some moments in life and other people at their worst. We experience faith living in the shadow of the cross while clinging to the promise of the Easter resurrection. In the season of Easter, we live on this side of the resurrection although we see it through a glass darkly. The realities of the cross are real even today. Jesus does not describe a world free of bandits and thieves. Jesus names the bandits as real, as the powers that rob us of life and health. So then, Jesus is the gate to the abundance of what? He says, “I came so that you may have LIFE and have it abundantly.” That he says this through the specter of the cross is key. Jesus lives a truth about the mess of human reality on the cross. Jesus overcomes that reality not by ignoring it but by dying on it. Lighting up our vulnerability through his own – vulnerability that cannot be ignored. So then we can stop pretending that we know enough and are strong enough to be our own gates, our own gods. Jesus promises an abundant life that is the power of the love of God in the midst of real threats, in the middle of thieves and bandits who kill and destroy, who show up in the valley of the shadow of death. Jesus is the gate through whose death and resurrection we enter and emerge into life abundant. Jesus is the gate who sees the truth of the whole you – the image of God in you and the worst of the brokenness in you. Jesus is the gate with whom you enter into the valley of the shadow of death, fearing no evil. Jesus is the gate who promises that death, when it comes, may win the moment but does not win the day when you breathe your last in this body and awake in the next. 1 Corinthians 13:12 For now we see through a glass, darkly, but then face to face. Now I know in part; but then shall I know, even as also I am known. Craig Koester, Gospel of John, Course Lecture at Luther Seminary, October, 13, 2010.